A New York Yankees minor-league affiliate says it was surprised by the controversy surrounding a “Blue Lives Matter Day” held at its ballpark Sunday. Social-justice activists and left-leaning websites criticized the timing of the event, which took place on the anniversary of Michael Brown’s death in Ferguson, Mo., but team officials insist it was simply a coincidence. Blue Lives Matter NYC, a charity for the families of law enforcement officers killed in the line of duty, hosted the fundraising event during a baseball game between the Staten Island Yankees and the Brooklyn Cyclones at the Richmond County Bank Ballpark. 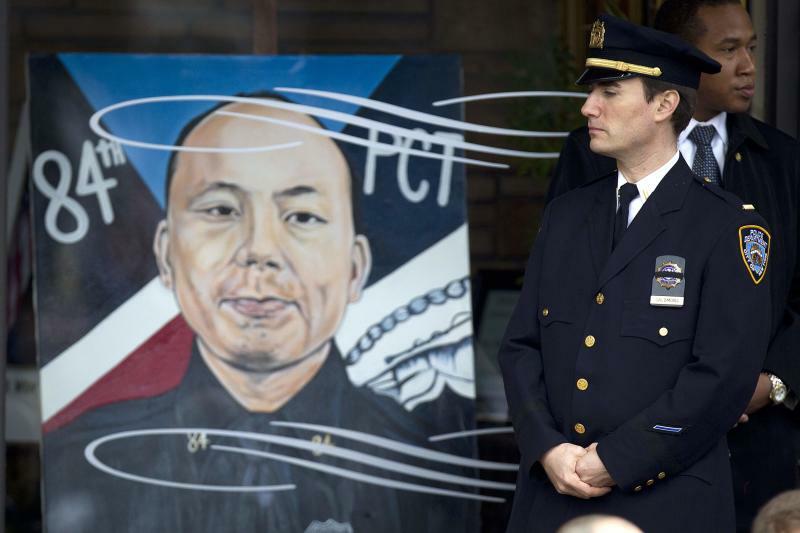 The families of NYPD detectives Wenjian Liu and Rafael Ramos — who were shot and killed by a lone gunman in Brooklyn in December 2014 — were honored during the ball game. One of Liu’s family members threw out the ceremonial first pitch. “It was treated just as we do with every group that comes in. It was pretty standard. We get these inquiries many times a week,” Jane Rogers, the team’s president and general manager, said in an interview with Yahoo News. The Staten Island Yankees, like many other minor-league teams, regularly let local charities run 50-50 lotteries during their ball games. NYPD Sgt. Joe Imperatrice, the nonprofit’s founder and president, likened the organization to the Make-A-Wish Foundation. He said no one was aware of the date’s significance during preparation. Their goal was to raise money for the Liu and Ramos families, who lost their main source of income, to help pay for their children’s college tuition. Attendees received a Blue Lives Matter wristband featuring the Staten Island Yankees logo with every ticket purchase. Many Black Lives Matter demonstrators are offended by the slogans Blue Lives Matter and All Lives Matter. Kirsten Savali, a cultural critic for the Root, an online magazine on African-American culture, said that with this event the baseball team “unapologetically spits” in the face of the Black Lives Matter movement. Similarly, Judd Legum, the editor in chief of the liberal blog Think Progress, argued that Blue Lives Matter is insensitive in that it draws attention away from victims of police violence. “Like the refrain ‘All Lives Matter,’ it is used — online and elsewhere — to undercut the notion that there is a particular problem with police brutality against people of color,” he wrote. Michael Holley, senior director of marketing and fan experience for the Staten Island Yankees, says he was caught off-guard by the negative press. “Maybe we should have seen it coming, but we were so focused on helping the families from day one that that’s where all of our thought has gone,” he said to Yahoo News. From the beginning, Holley said, Blue Lives Matter NYC made it clear that they were not interested in turning the stadium into a political space. The group knew that both deceased officers’ families were baseball fans, he said.